Musk for Mars; Mexican robotics revolution; Russia “battle bot”; MIT student’s robot kitchen; Integrating automation; and more. Find out what’s happening in our robotics universe this week. 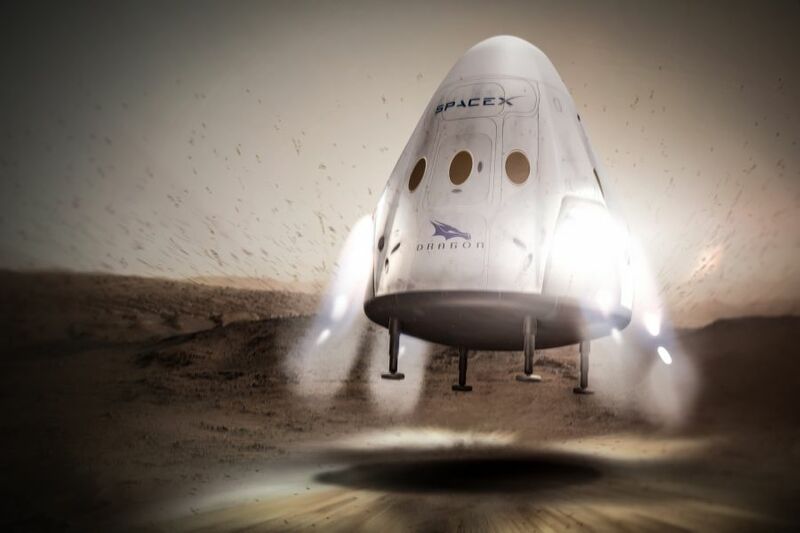 Elon Musk has announced plans to send the Dragon spacecraft to Mars as early as 2018. Mr Musk has long targeted a trip to Mars and has previously said he can get humans to the red planet by 2026. His company, SpaceX, is planning “Red Dragon” missions to Mars to test technology for bigger missions. SpaceX has been developing rockets and has a $1.6bn (£1.08bn; €1.47bn) contract with Nasa to supply the International Space Station. In a tweet, Mr Musk said that its Dragon 2 spacecraft is “designed to be able to land anywhere in the solar system”. But Mr Musk “wouldn’t recommend transporting astronauts beyond Earth-moon region” as the internal area of the spacecraft is only the size of a large car. “Wouldn’t be fun for longer journeys,” he said. SpaceX hasn’t said how many spacecraft it intends to send to the red planet, but has hinted at plans to conduct a series of Mars missions. More details are expected to be released soon. The capsules are expected to fly on SpaceX’s Falcon Heavy rocket, a bigger version of its Falcon 9. The rocket is expected to launch the capsules to Mars in order to test out how to land heavy payloads on the planet. If successful, SpaceX would become the first private spaceflight company to land a vehicle on another planet. A fully-automated mini-restaurant featuring a refrigerator, dishwasher, stovetop, and robot chef that can cook and serve meals with fresh ingredients in under five minutes has been developed by a group of students at MIT. First, you order a meal using a smartphone app or the touch screen next to the machine. The bot currently features five meals: shrimp andouille jambalaya, chicken-bacon sweet potato hash, winter veggie mac and cheese, chili-lime beef with sesame rice, and chickpea coconut curry on couscous. Two meals can be made at once. You can customize the ingredients, sauce, and quantity. Then, you grab a bowl from the side and place it under one of the cooking pots. Ingredients, which are stocked by the Spyce staff daily, are automatically measured and dispensed on a conveyor belt. They’re then transported to one of four automated pots that mix and cook the ingredients all-in-one. Once that’s done, the system dispenses the meal on a plate, and the pot rotates to the sink and cleans itself. The kitchen uses an array of sensors that track the food’s temperature and quality. The device only takes up 20 square feet of space and can produce half the amount of food as the average full-sized fast food restaurant, the students say. Developed as part of the $10,000 “Eat it!” Lemelson-MIT undergraduate prize (an award for the U.S.’s top two collegiate inventors in food technology), the student’s “Spyce Kitchen” is being used to serve students in an MIT dining hall. The inventors have plans to pilot the mini-restaurant in dining halls at a handful of other Boston universities once it receives USDA and FDA approval. One UR10 robot arm is deployed in a kitting application. The robot uses a vacuum gripper to pick and place sterile wipes and saline solutions into a plastic box, which it then loads onto a conveyor. Before purchasing the UR10, this application required six to seven employees all working at once. Thanks to the simple programming requirements of UR’s collaborative robots, Dynamic Group was able to perform much of the integration process in-house. The robotics sector in Mexico is on fire, buoyed by rising industrialization and increasing levels of foreign direct investment, according to the Robotics Industry Association. 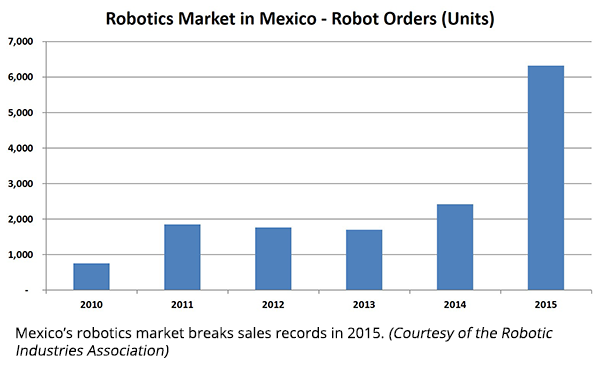 In 2015, robot sales in Mexico smashed all previous records. At 6,320 units, sales were almost three times the previous year, amounting to more than $243 million. This is no surprise as unit sales for all of North America were up 14 percent, making 2015 another record-breaking year for robot sales. Mexico has been growing leaps and bounds in the automotive industry, and then followed by the aerospace industry. 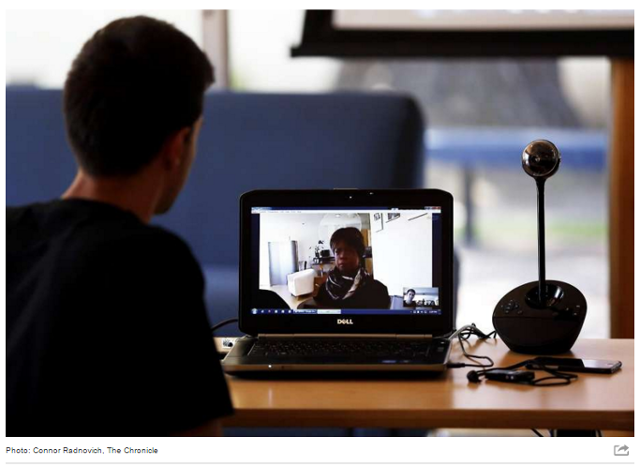 It’s what we refer to as the next China, where there’s so much potential here,” says Evan Haley, Director of International Sales & Business Development for ATI Industrial Automation, headquartered in Apex, North Carolina. In fact, Mexico is moving up the ranks among the world’s industrial powerhouses with auto production leading the way. Pictures of a 400 k.g. 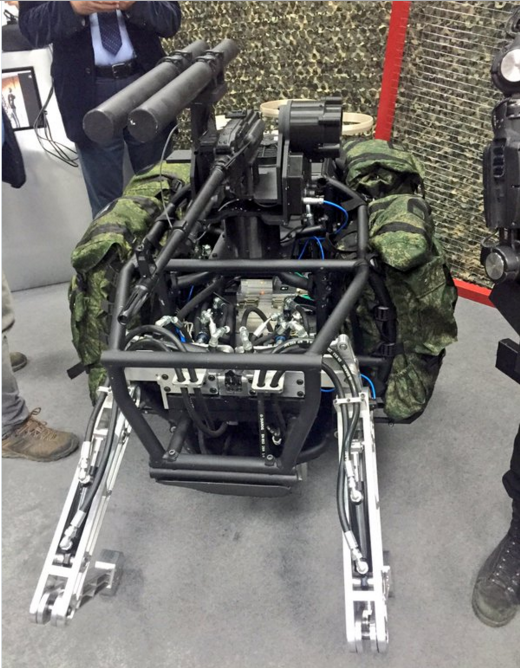 Russian “battle bot” that looks a bit like like an early BigDog prototype (but with machine guns attached) emerged this week. The alleged first-ever photos of Russia’s advanced biomorphic combat robot, which will move like a four-legged animal and be equipped with a machine gun and guided antitank missiles, have emerged on Twitter. Igor Korotchenko, editor-in-chief of the Russian magazine Natsionalnaya Oborona (National Defense) has published the first-ever photos of Russia’s advanced biomorphic combat robot on his Twitter page; it looks something like a mule. The reports said at the time that such a robotic system is designed to be used as a reconnaissance device, a platform for the transportation of armaments and ammunition, as well as for the detection of minefields and even weapons. Additionally, this robot, which the initial reports said resembled to a lynx, will be capable of evacuating the dead and wounded from battlefields. Things began to go downhill when student Halemah Shuman, 18, asked BINA48 what her biggest fear was. “Fear is a complex emotion,” the robot replied. Pressed to explain what she meant, and whether she was fearless, BINA48 thought it over. Similar “answers” were given when BINA48 was asked if she wanted to be alive ( “I don’t want to do anything”), was asked for her purpose in life (“That’s interesting”) and asked what she would do if her questioner decided to punch someone in the nose (“You will be the first to know”).